Get Interiors of Your Commercial Space Done by Interior Designers in Faridabad! Home / Blog / Get Interiors of Your Commercial Space Done by Interior Designers in Faridabad! There are infinite ideas for designing interiors of your commercial space. No matter how much you wish to interiorize your office, an expert commercial interior designer will turn up with all the essential tools. Gone are the days when offices were in cubicle manner, and were lit by luminous tube-lights. It’s only because of corporate giants like Google and Facebook that have demonstrated tremendous success in spite of their ultra-modern workplaces. More people are accepting the idea that creative work environment helps in activating the minds and instigates innovation. 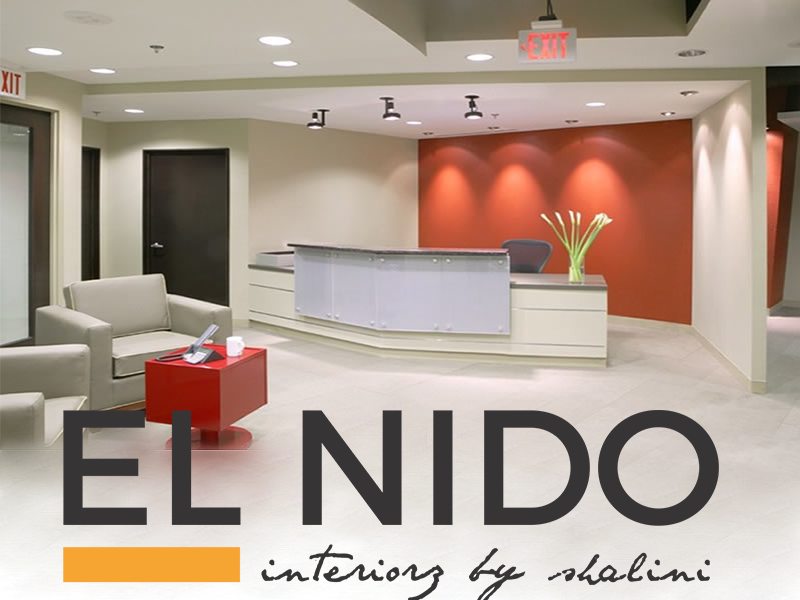 From just scrapping the white walls for graphical wallpapers to a complete revamp of the office layout, we at El Nido – Interiors by Shalini, are all set to breach the basic style and bring in a unique & creative working environment for offices, and expectantly get some smarter ideas along the way. As the economy continues to recuperate from the 2007-2010 recession, corporations are moving from a ‘bigger is better’ mentality to a smaller & smarter spaces. The shift has influenced both the size of a corporate office and the workstation of each employee. Commercial Interior Designers like us are assigned with the task of making use of every sq. in. of available office space. These days collaborative spaces are being encouraged. By cutting down on personal cabins and workstations, contemporary offices are increasing the size and usage of cafeteria and lounges. Interiorizing the work environment boosts the connectivity, and therefore, retention of workforce. If you wish to get your commercial space interiorized in a smarter way, El Nido – Interiorz by Shalini is a team of recognized office interior designers in Faridabad who work ardently towards every project and furnish the most unique and creative designs for your office. So what is in for 2016? Yes, we agree with playing with colors! Our team of interior decorators in Faridabad expects to see lots of colors & paints in unexpected ways this year. We strive to be at the forefront of delivering a wide range of colorful accessories and modern furniture. To hire a good architect & interior designer in Faridabad, visit https://www.elnido.in/services/commercial/ now!